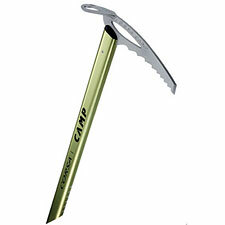 With its all-aluminum Corsa Ice Axe, CAMP USA continues an impressive tradition of creating outrageously light and functional backcountry gear. The Corsa may well be the world's lightest CE B-rated axe, weighing a wispy but fully-functional 7.4 ounces (50cm — measured!). Compared to other ultralight aluminum axes, the Corsa seems to make far fewer design compromises. The pick, for example, is no thicker than usual, so you won't have trouble getting it to bite in hard snow. The base of the shaft features six machined groves, for better grip in soft-palmed gloves and mittens. For ultralight mountaineering applications, the Corsa's design is a marvel of simplicity, and a surprisingly effective axe given its all-aluminum design. No, you do not want to face any significant ice or mixed climbing with the Corsa. But if you're primarily a ski mountaineer with little more than hard spring corn on the agenda, why would you ever want to carry anything else? Adventure Racers will love the Corsa's insignificant weight—without having to compromise away safety when using the axe to self arrest or self belay. As for general mountaineering, the Corsa will be appropriate only in those situations where weight trumps all other concerns. I would prefer not to have to rappel off it, for example, though no doubt people will use it for modest glacier travel. In terms of quirks, the Corsa is mercifully free from design annoyances. This is a clean, elegant tool that will get the job done without driving you crazy. Note that the 50-cm Corsa comes with an unplugged shaft (as compared to the 60 and 70 cm versions). I often carry an axe for insurance, and for this purpose the Corsa is without peer. Strap it to your pack and it's there if needed. If not, well, you'll hardly begrudge seven extra ounces.